The view from the picnic area at Hog Island. To celebrate a friend’s 30th birthday, the team headed out to the wild and rugged coastline near Point Reyes on Tomales Bay to consume large quantities of oysters. It is unfortunate for me that most marine life is off limits. I have the appetite and constitution to consume and imbibe almost everything except for animals that swim, crawl or merely exist in the ocean. I have had my fill of trout, bass and catfish but for some reason when I have nibbled on delicacies such as sturgeon, salmon, swordfish and other such fare, my stomach revolts in a most unpleasant manner. I was not looking forward to oysters, but I was eager to get out to the coast. I have always loved the drive out to the Sonoma or Marin county coastline. The drive is even more enjoyable this time of year during a day with an unsettled sky hung with heavy, gray clouds that occasionally part allowing brilliant rays of sunshine to drench hills that are a shade of green so vibrant it almost seems unnatural. The winding roads, gnarled coastal trees and large formations of gray rock dotting the many cow pastures make one feel as if you’re in another time and country even though Petaluma or Novato and traffic-jammed Highway 101 are almost just over the next hill. After the pleasant drive, I had an immediate reminder as to why Christine and I don’t travel out to the coast much on food expeditions. As I stepped out of our car I was met with the nauseating smell of seafood emanating from piles of oyster shells that had been thrown on the Hog Island’s parking area. I can’t stand the smell, it’s a rotten, decayed odor that hovers over decrepit piers or bait shacks. I admit, for all my pretensions of loving the good life, I just can’t stomach the thought of eating some of the fishy things like oysters that other people love. I am resolved to try them at some point in my life, but on that particular day with a two-hour drive to get home, and the chance of digestive stress, I was not going to experiment. If you do like oysters, I am told by many that Hog Island has wonderful oysters grown on site in the clean waters of Tomales Bay. 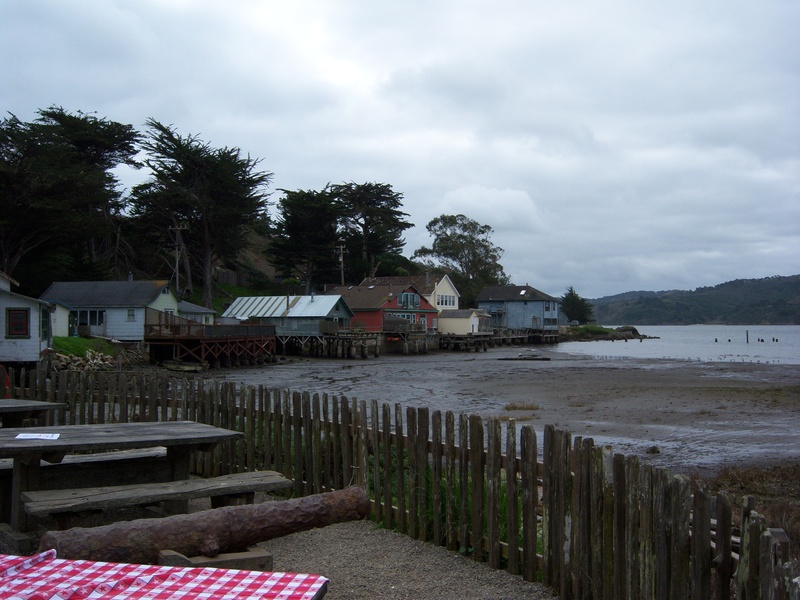 Our group had rented two tables in the picnic area at Hog Island with wonderful views of the bay. Christine and I had brought along a bottle of sparkling rosé wine and a still rosé Syrah that she said paired well with the oysters. For myself, I had a ham and salami sandwich. (And frankly, it was a damn good sandwich.) 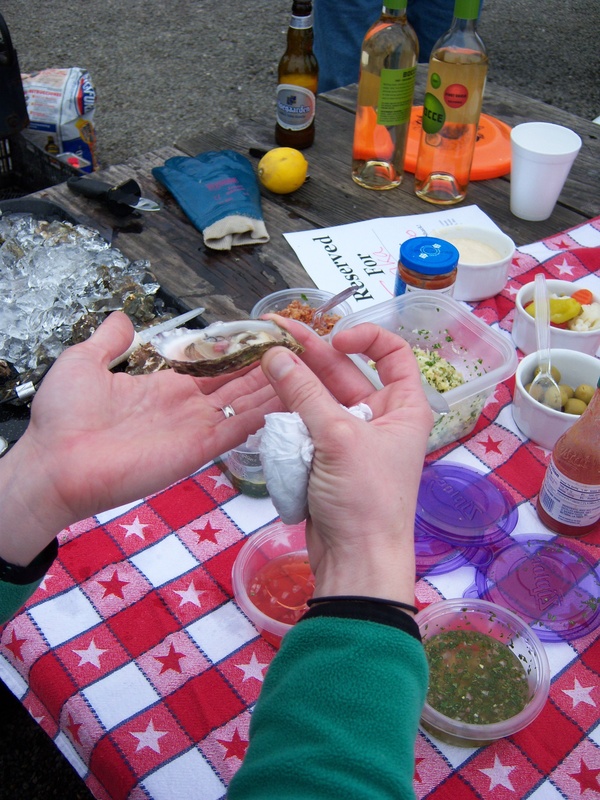 Hog Island’s picnic area has grills available for warming oysters although you need to bring your own charcoal or buy some at the Hog Island store. Dogs are allowed and we brought CoCo our lab but you have to keep them on a leash. For most of the afternoon, our little picnic point was buffeted by cold winds coming off the water. Later in the day, however, the clouds opened up to reveal a blue sky and the sun. The sunshine and convivial atmosphere of oysters and an open fire made me feel as if I was back in Nantucket or some other glamorous destination. But then I thought, no, I’m on the beautiful California coast near Pt. Reyes. This is one of the most gorgeous areas in the country. One can find Hog Island oysters at the Ferry Building in San Francisco or at the Oxbow public market in Napa. A really fun experience though, even for an unhappy soul like myself for whom the delights of oysters are forbidden by a fickle stomach, is to visit the island first hand. I may not have enjoyed the oysters but I loved the beauty of the coast and the company of good friends.